The Roland VersaUV LEF-200 offers countless product customization possibilities, including printing directly on three-dimensional objects up to 3.94” thick. Featuring a host of unique ink options and optional on-board Primer, it quickly and effectively prints onto a wide variety of promotional products and media substrates. Print graphics with incredible detail and color on a virtually unlimited range of promotional products. Produce stunning graphics with CMYK colors. Gloss ink, which provides spot gloss or matte finishes as well as stylish embossed effects. White ink, that acts as a brilliant spot color, or to ensure bright color quality on dark or clear surfaces. An optional Primer is also available, it increases efficiency by streamlining the print process on materials like acrylic and plastic. The features that make the Roland VersaUV LEF-200, the most versatile flatbed printer in its class, includes the new VersaWorks Dual RIP software for easy processing of files, including transparencies and quick setup of White ink, Gloss ink, and other ink layers. An advanced UV-LED curing system expedites production and an intuitive distance print mode, with a height tolerance of 2mm, ensures outstanding consistency on irregular and curved objects. There are up to 40 job presets allowing the recall of specific media settings for your most popular applications. A height sensor bar made with a non-magnetic material, for printing on magnetic items such as iPad covers, while the optional RotaPrint attachment enables users to print onto cylindrical objects. 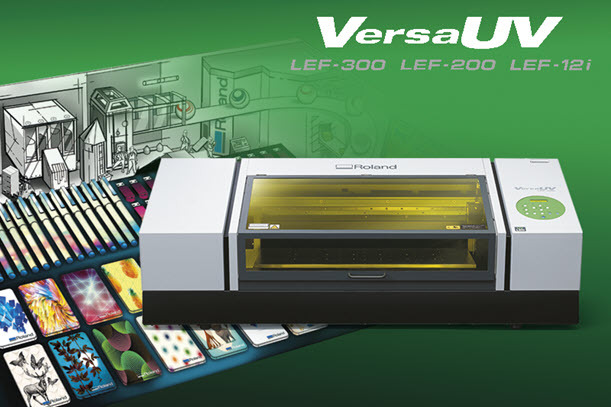 The Roland VersaUV LEF-200 features an optional on-board primer cartridge for priming objects quickly and conveniently on a selection of different media substrates. Users can easily prep an object for customization printing Primer ink directly from a file in VersaWorks Dual RIP before printing the full-color graphic. This makes adding graphics to challenging materials much more clean and efficient. The Roland VersaUV LEF-200 uses an LED for UV-curing that last up to ten times longer than conventional UV lamps and can be instantly switched on or off, giving the user true on-demand production without the typical warm-up time. In addition, the LEF automatically enters a low-power mode when it is not used for an extended period of time. Printing around the most complex corners and curves, advanced Roland ECO-UV® inks enable printing on a vast array of shapes and surfaces. The Roland VersaUV LEF-200 also features an Automated Ink Circulation System that prevents ink pigments from settling in the ink lines for consistently brilliant image quality with a smooth consistency and density, even on long print runs. Printing white and CMYK onto bottles and cylindrical objects is an absolute snap with the new RotaPrint attachment for the Roland VersaUV LEF-200 flatbed printer. Simple to install and remove, it utilizes the Roland VersaUV LEF-200’s existing feed system and enables the LEF to print cleanly and precisely onto a wide range of materials with a diameter between 1.6 to 3 inches (40 mm to 77 mm). With its sturdy build, RotaPrint is also consistently and reliably accurate, ensuring precise stepping during rotation. Acceptable Media Max: 21.2" X 14.2" X 3.94"
Dimensions: Width: 47.4", Depth: 37.9", Height: 21.7"
The Roland VersaUV LEF-200 makes it fast and easy to print on a wide range of materials to create unique products to ensure your business succeeds. We have additional Introduction and Training Videos for the Roland VersaUV LEF-200. Want to learn more about the Roland LEF-200 and UV Printing? Want to learn more about the Roland VersaUV LEF-200? Download the Roland VersaUV LEF-200 Brochure. The Roland VersaUV LEF-200 offers countless product customization possibilities, including printing directly on three-dimensional objects up to 3.94” thick. Featuring a host of unique ink options and optional onboard Primer, it quickly and effectively prints onto a wide variety of promotional products and media substrates. Printing white and CMYK onto bottles and cylindrical objects is an absolute snap with the new RotaPrint attachment for the Roland VersaUV LEF-200 flatbed printer. Simple to install and remove, it utilizes the Roland VersaUV LEF-200’s existing feed system and enables the Roland VersaUV LEF-200 to print cleanly and precisely onto a wide range of materials with a diameter between 1.6 to 3 inches (40 mm to 77 mm). With its sturdy build, RotaPrint is also consistently and reliably accurate, ensuring precise stepping during rotation. Please note: Considering that you will be using software such as Illustrator, we recommend that you use as a high-performance computer as possible to reduce RIP processing time.